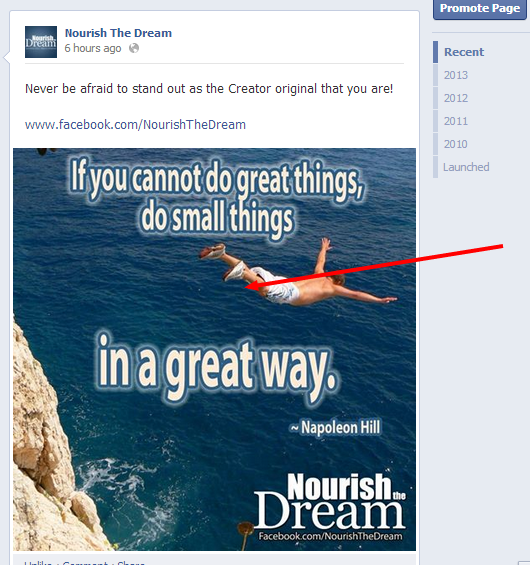 You find (or create) the perfect image… you upload it to Facebook… you write the perfect text to go along with it… and boom!, you publish it on your page. Sometimes it’s instant. Sometimes it’s hours later. But somewhere along the line, you spot the typo. Or you realize you forgot the link you intended to add. But it’s too late. The post already has “Likes” or “Comments.” You can’t take it down because you don’t want to lose the engagement you’ve gained. What to do?! 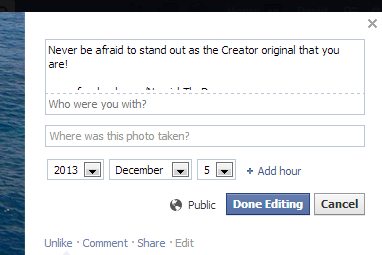 Good news: you can edit the text you wrote when you posted your image. This box is a little tricky. If you have multiple lines of text, it’s hard to “scroll” inside the box, so I recommend that you click once to put your cursor in the box and then use your arrow keys to navigate around. 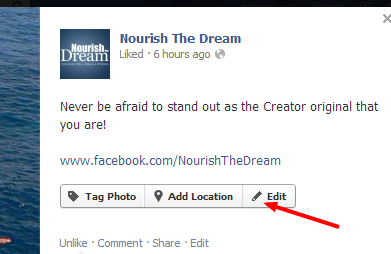 Once you’ve made the changes you wanted to make, click the “Done Editing” box… and voila!… your changes are made!